At least 4 species of storks lived in North America during the Pleistocene. The wood stork (Mycteria americana), the only surviving species, is nearly absent from the fossil record. It is known from just 1 fossil site–a tar seep in Cuba. This fossil specimen was found associated with fossils from 2 other species of stork including Wetmore’s (M. wetmori), a similar species but distinctly larger. Fossil evidence of Wetmore’s stork has also been excavated from sites in Florida and California, indicating it was a widespread species. Prior to the discovery that wood storks co-existed with Wetmore’s storks on Cuba, scientists assumed the former didn’t colonize North America until the extinction of the latter at the end of the Pleistocene. But this discovery casts doubt on that assumption. Wood storks may have lived in parts of North America where the process of fossilization was uncommon. There is evidence that 2 species of large owls lived in Georgia during the Pleistocene, but the fossil material is so scant scientists are unable to as yet describe the species. This demonstrates how incomplete the fossil record can be. The other species of stork that lived in Cuba then was an unknown and undescribed species in the Ciconia genus. There are 7 extant species of storks in the Ciconia genus including the well known white stork (Ciconia ciconia), a bird that winters in Africa, summers in Europe, and according to legend, brings babies to awaiting parents. The maguari stork (C. maguari) ranges throughout South America where flooded grasslands predominate. It’s the only extant American stork in the Ciconia genus. The extinct asphalt stork (C. maltha) was a North American bird, named for specimens found in the asphalt-like tar pits of California. Fossils of this species have been excavated from 34 sites in Florida, 2 sites in California, 1 site in Idaho, and 1 site in Mexico. (The Mexican specimen was not conclusively identified.) The sites in Florida date from the early Pliocene to the late Pleistocene. The asphalt stork, as a species, existed for at least 5 million years and likely occurred over a wide continental range for most of that timespan. Though it was closely related to the white stork, the asphalt stork probably occupied an ecological niche similar to that of the marabou stork (Leptoptilos crumeriferus). Video of marabou storks sharing a carcass with African vultures. Note the featherless head and neck. This prevents contamination from toxic bacteria on the rotting meat they eat. Video of marabou storks vs. a pack of mongoose. The marabou stork scavenges and hunts the African plains but nests in woodlands. They catch and eat small mammals, bird nestlings, reptiles and amphibians, and insects. They also rely on carrion, garbage, and even feces. They often follow vultures, waiting for them to tear open the carcasses before taking advantage of the meal. Stork bills are incapable of opening tough hides. Species closely related to Old World vultures lived in North America during the Pleistocene. The asphalt stork likely followed vultures and scavenged in much the same manner as the marabou stork. The extinction of North America’s megafauna led to the extinction of avian scavengers including teratorns, Old World vultures, and asphalt storks. The asphalt stork was a big bird, reaching 4.5 feet tall. It would have been entertaining to watch scavengers make carcasses disappear during the Pleistocene. Giant short-faced bears ruled, but if they weren’t around, there would have been battles between coyotes and storks. With their big bills, storks probably held their own against the smaller canids. Organisms with disjunct range distributions fascinate me because they provide clues about past natural environments. Direct evidence of past landscapes is rare–over 99% of potential fossil evidence has vanished without being preserved in any way. The existence of extant species with odd distributions helps fill in gaps in our knowledge of natural history, though it requires some uncertain speculation. The sand myrtle is 1 of many species with an interesting disjunct range distribution. 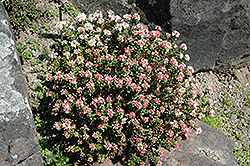 This member of the heath family (rhododendrons and blueberries) is found in the sandhills of southern New Jersey; the mountains of northeastern Georgia, eastern Tennessee, and western North Carolina; the sandhills of North Carolina’s coastal plain, and some isolated monadnocks in the upper South Carolina piedmont. Caesar’s Head State Park in South Carolina. Sand myrtles grow on isolated rocky hills such as this. A sand myrtle in full bloom. They are a short plant, growing to just 20 inches in height. They can’t grow under tree canopies. Range map of Kalmia buxifolia shaded in light green. The populations are more isolated than this map indicates. One is left to wonder why the sand myrtle disappeared from or doesn’t occur in the areas between its disjunct populations. One hypothesis could be that it reached suitable habitat through seed transport via bird droppings. But the great distances between disjunct populations precludes this possibility. The seeds, if they even stayed viable within the bird’s digestive system, would be excreted long before they reached the other territories. Wind distribution is a more viable hypothesis. Winds carry insects, pollen, and light seeds great distances, and this light organic material eventually settles. Still, this seems an unlikely explanation because sand myrtle should occasionally be found growing in areas between their current distribution, even if the habitat is unsuitable. The most likely hypothesis requires a bit more complicated explanation. Sand myrtle may have existed throughout the entire region during the dry climatic phase of the late Pliocene/early Pleistocene. Today, sand myrtle favors open sunny conditions on poor rocky or sandy soils. Arid grasslands expanded when dry climates prevailed in the south. These dry prairie and scrub habitats were subjected to overgrazing by herds of megafauna, leading to bare soils, especially during droughts. Windy conditions stripped the top soil. Sand myrtle was able to grow on these poor soils with little competition from trees. When climatic conditions changed to a wetter cycle, deciduous forests expanded and outcompeted sand myrtle by shading them. Grassy savannahs were also unsuitable now because frequent lightning strikes led to more fires. Sand myrtle is both fire and shade intolerant and can only survive in communities with poor shallow soils where fire is infrequent. This probably explains why sand myrtle is currently found in rocky mountains and sand hills and nowhere else. 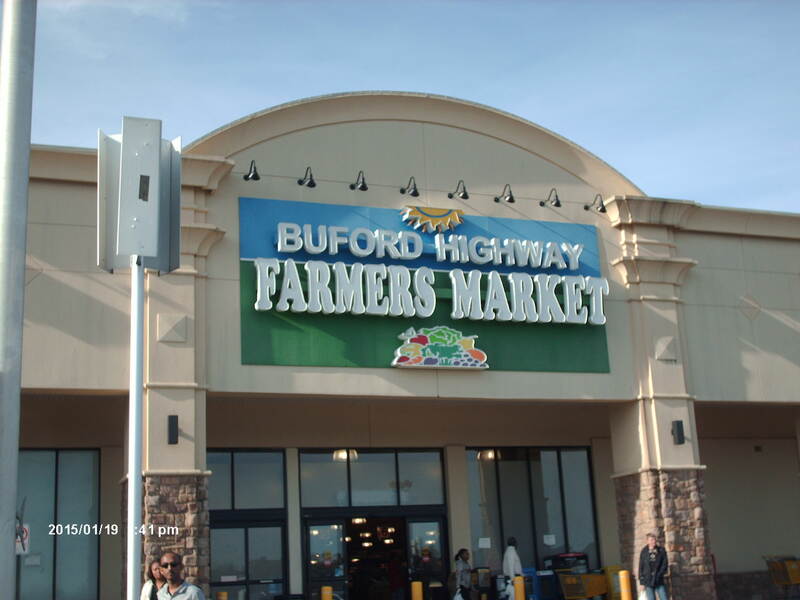 In my last blog entry I reported my visit to the Buford Highway Farmer’s Market. One of the products I purchased was cod liver in a can. I had a chance to try it yesterday. When I opened the can, I was surprised to find that most of the volume was filled with oil rendered down from cooking the liver in the can. I removed over half of the liver and squirted lemon juice on it. The first bites tasted like canned tuna, and maybe a little like oysters. But the texture was very soft. I started having a hard time accepting such a soft texture, so I ate the rest of this portion on buttered toast. This soft texture was not unlike that of scrambled eggs. I’m used to eating scrambled eggs, but I usually put lots of shredded cheddar cheese and smoked chipotle pepper in my eggs, and I also put them on buttered toast. Even with these additions, I still prefer eating my scrambled eggs with either salsa or brown mushroom gravy. Eggs are just so bland by themselves. I debated with myself whether to eat the rest of the cod liver for lunch today, but last night I fed it to the cat. Instead, I’m going to have a nice salami sandwich. The woods look drab this time of year in Georgia, even for a naturalist like me. I satisfied my hunger for the natural world by visiting the Buford Highway Farmer’s Market instead of taking a stroll through a winter-dulled park. Most people don’t think about this when they go grocery shopping, but every vegetable, fruit, and animal product in the store descends from a species that lived during the Pleistocene. The stories behind the origins of each could fill volumes of history, but I’m just going to focus on a couple I noticed on this visit. The Buford Highway Farmer’s Market in Doraville (a suburb swallowed by Atlanta’s suburban sprawl). It was featured on Andrew Zimmern’s series Bizarre Foods. The Buford Highway Farmer’s Market is located in Doraville, Georgia; a former suburb of Atlanta that’s been engulfed by that city’s sprawl. The store is just off the I-285 bypass at Exit 32. The produce section is enormous with high quality fruits and vegetables from around the world. The produce section is huge. This is just half of it. There were some items I’d never seen before including white immature coconuts, spiny chayotes, and fresh jackfruit. The size of the jackfruit (Artocarpus heterophyllus) surprised me. They look like a fruit for a giant species of megafauna, and indeed elephants do feed on them. 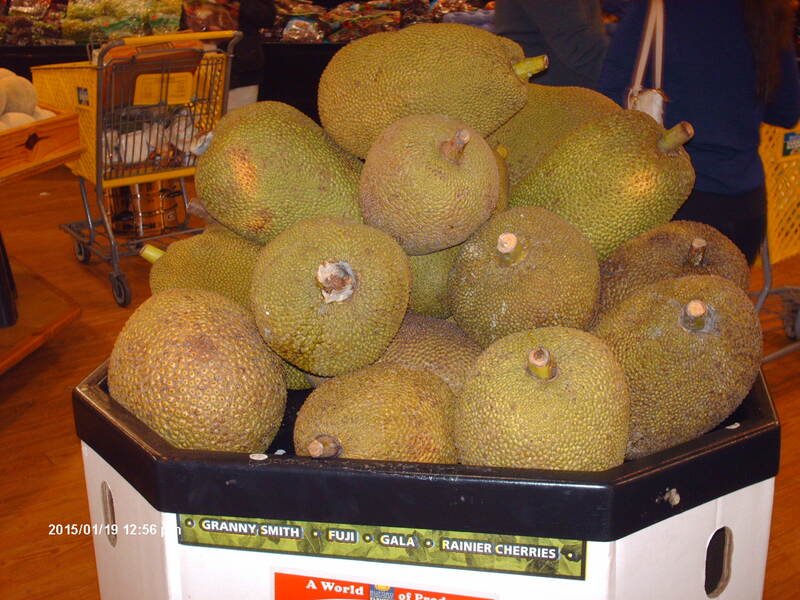 The jackfruit belongs to the same family as mulberries and figs. I didn’t purchase any because 1 jackfruit could feed a family of 20. I have eaten canned and dried jackfruit. They are very sweet and have a texture similar to pineapple but the taste is unique. Jackfruit is native to the tropical forests of southwestern India, but man has spread them throughout tropical Asia, Africa, and Brazil. Jackfruit trees grow wild as an invasive species in Brazil where coatimundi and monkey populations have benefited from the abundant new source of fruit. The coatimundis and monkeys also eat birds’ eggs, so bird populations decline in Brazilian jackfruit forests. Jackfruits have been cultivated for thousands of years–nobody knows exactly when they were first deliberately planted by man. Jackfruit is as large or larger than watermelon. Looks like just the right size for an elephant. Here’s video of an elephant eating jackfruit in India. 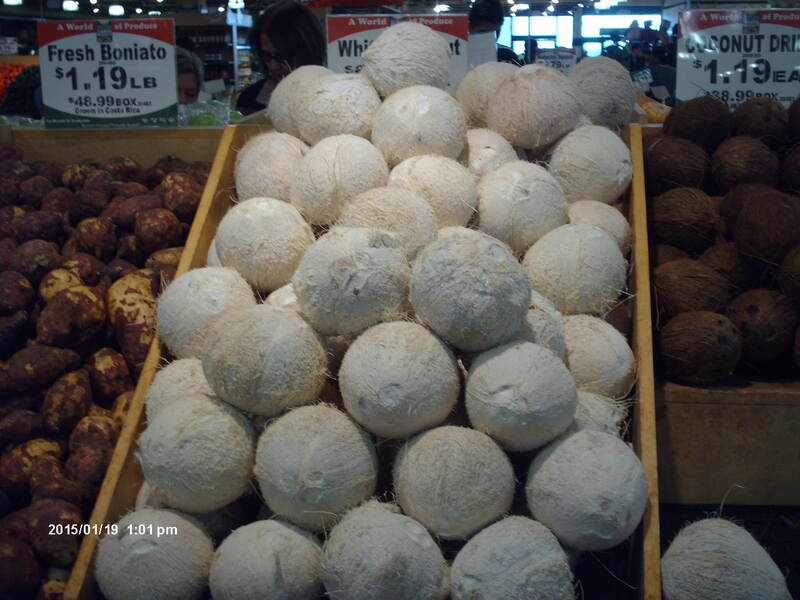 This is the first time I’d ever seen white coconuts. 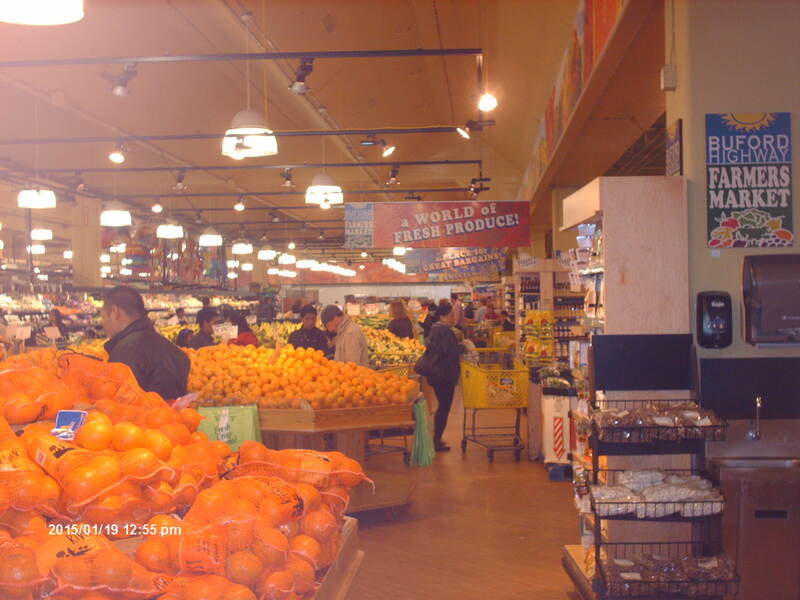 Beyond the amazing produce aisle, the store is divided into ethnic sections–Mexican, Eastern European, American, Indian, Chinese, Japanese, Korean, etc. I found some delicious kimchi in the Korean wing of the store. Kimchi is the national condiment of Korea made from fermented napa cabbage, daikon (a long radish), green onions, red hot peppers, ginger, fish sauce, and salt. I love it. Kimchi has been made for thousands of years but 1 important ingredient–red pepper–wasn’t used until its introduction to the region in 1598. Napa cabbage (Brassica rapa Pekinese) is not actually a cabbage (Brassica oleracea) but rather a turnip bred for the luscious stem and leaves instead of the root. The same holds true for bok choy (B. rapa. chinensis). The brassica family also includes mustards. Brassica pollen is often found in Pleistocene-aged pollen samples. During the Ice Ages wild cabbage, turnip, and mustard grew in temperate region wet meadows. These are some of the goodies I purchased. Honey which ironically is from an apiary in Waynesboro 30 minutes from my house, sweet potato chips, cod liver in a can from Norway, and kimchi imported from Korea. 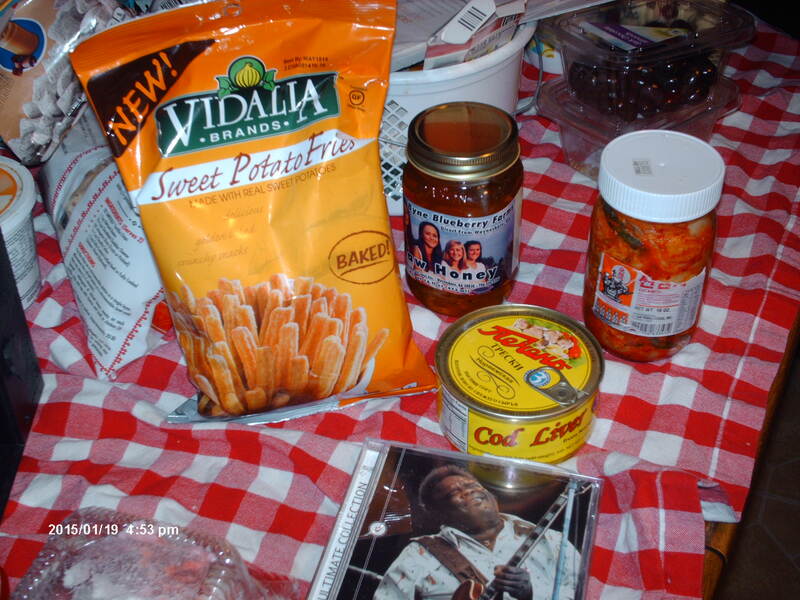 The kimchi is so good it sent me into ecstasy not unlike the look on the face of Freddie King (on the cd cover below the canned cod liver). He is one of the greatest electric guitar players of all time. The flavor of kimchi depends upon a fermenting bacteria known as Lactobacillus kimchii. This is not unusual–cheese and sourdough bread require fermenting bacteria to give them flavor. I like to mix kimchi with cream cheese and eat it on crackers. The spicy acidity of the kimchi plays well with the rich fat of the cream cheese. The flavor of kimchi varies with its region of origin. I’ve had some so salty I considered it inedible but the brand in the above photo is excellent. I’ve also made my own from vegetables I grew in my garden including napa cabbage, turnip, and hot red peppers. I added ginger and salt. It was good and got even better when I let it sit in the refrigerator for a couple of weeks to develop the funky flavor. The only unusual food I purchased was canned cod liver imported from Norway. I’ve never eaten fish liver before. I’m planning on breading and frying it. I’m not afraid of fish organs. A procyonid (Cyonasaura) was among the first North American mammals that island-hopped to South America before a landbridge between the 2 continents full emerged. Like its living cousin, the raccoon, the cyonosaura was attracted to aquatic environments, thus explaining how, perchance, it found its way across islands to South America. An ecological niche for a bear-sized omnivore was available on this continent, so cyonasaura evolved into chapmalania, a beast that was really just a giant raccoon. There were few carnivores capable of stopping chapmalania from muscling in on a carcass here then. Scientists have discovered evidence chapmalania scavenged a dead glyptodont–teeth marks on 1 individual fossil exactly match those of the giant raccoon. However, chapmalania probably had a varied diet that included plant matter and aquatic organisms. Chapmalania lived during the Pliocene from 5 million years BP-1.9 million years BP. Bears finally made it to South America at the end of the Pliocene, and they eventually occupied chapmalania’s ecological niche. They probably outcompeted and replaced them. Size comparison between the giant raccoon, a human, and a Volkswagon. Although chapmalania became extinct, there are still at least 17 living species of procyonids. The most familiar are the abundant North American raccoon (Procyon lotor), and the crab-eating raccoon (P. cancrivan) of South America. The pygmy raccoon (P. pygmaeus) is restricted to the Cozumel Island off the Yucatan peninsula of Mexico. This island has been isolated from the mainland for 100,000 years, and genetic studies suggest the Cozumel raccoon diverged from its ancestral population about 60,000 years ago. The pygmy raccoon of Cozumel Island off the coast of Yucatan. They differ from more familiar raccoons in their smaller size and golden ringed tails. There are 4 species of coatimundis. 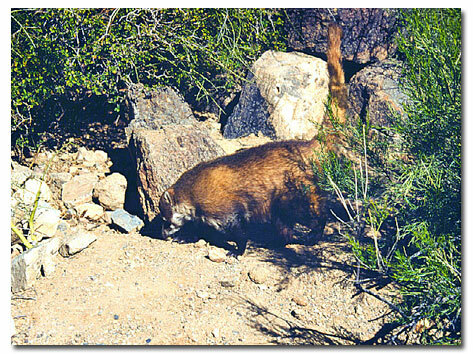 The white-nosed coatimundi (Nasua naria) ranges throughout Mexica and as far north as Arizona. N. nasua lives in the tropical jungles of South America, while the other 2 species of coatimundis are restricted to cloud forests there. White-nosed coatimundi, an inhabitant of Mexican deserts. The ringtail (Bassariscus astutus) inhabits rocky arid habitats throughout Mexico and as far north as Oregon and as far east as Kansas. They’re known as miner’s cats because they tamed easily and lived in miner’s cabins where they kept mice populations low. A new species of ringtail (B sumichasti) was discovered in 2013. Ringtails. Another procyonid that prefers arid habitat. The kinkajou (Potus flavus) and olingos (Bassaricyon sps.) inhabit the canopies of tropical forests where they subsist on fruit and insects. The kinkajou lives in tropical forest canopies. The largest flying bird known to science was the giant teratorn, an extinct condor that lived in South America during the Miocene over 5 million years ago. It had a wingspan of 21 feet and weighed an astonishing 155 pounds. It inhabited the Andean Mountains and dry flat pampas, but fossils from this era are rare, and we don’t really know the full extent of its range. A bird of this size likely had a long lifespan of 50-100 years. Scientists disagree about its dietary habits. Some think it was an active predator, swallowing relatively small prey whole because its beak was not built for tearing open large carcasses with tough hides. However, others believe it was mostly a scavenger because a bird of this size would require 20 pounds of meat per day, and it’s unlikely consuming small animals could satisfy this appetite. I agree with the latter speculation, though the teratorn may have ingested small animals, if given the opportunity. It was related to storks and New World vultures, both of which are opportunistic feeders. Size comparison between the largest flying bird known to science and a school bus. Specimens of the giant teratorn are only known from 4 localities in South America. Scientists are interested in figuring out how such a large heavy bird could fly, but the amount of fossil material available from this species is meager, making it difficult to determine this from the few bones they have. Happily for them, there is abundant fossil material of the closely related North American teratorn–Teratornis merriami. Over 100 specimens of this late Pleistocene species have been excavated from the Rancho la brea tar pits in California. Additional fossil specimens of North American teratorns have been found in Arizona, Nevada, Florida, and New York. It had a continent wide distribution but probably occurred in low numbers–a slow breeding yet long-lived species. T. merriami had a wingspan of 11 feet, less than that of its South American cousin, but still impressive. Nevertheless, the similarity in anatomy between the 2 species allowed scientists to use specimens of T. merriami to determine how the giant teratorn could fly. Scientists think it had to run downhill against the wind to get airborne. Then, it could ride rising warm air (thermals) to get high in the sky where it searched for carrion. It was more of a glider than a flyer. Just a slight slope in the land would have been adequate for a teratorn to get airborne. Thermals can occur in a very small space, and teratorns could circle inside these quite narrow thermals to attain height. Diagram from paper referenced below (Chatterjee 2007) showing how the giant terratorn took off and landed. No extant species of flying birds approach the wingspan and weight of the giant teratorn, but some are almost as big as the late Pleistocene Merriam’s teratorn. The kari bustard (Ardeotis tardi), a kind of crane, reaches 40 pounds. The largest turkey (Maleagris gallopavo) ever killed by a hunter weighed 37 pounds. Dalmatian pelicans (Pelecanus crispus) are heavy flying birds. The greater albatross (Diomedea exulans) has a wingspan of 11 feet. This species gets airborne by running into the wind downslope from the top of waves, much like the extinct teratorns. The Andean condor (Vultur gryphus) is the most similar living species to the teratorn. They are closely related and likely occupy a similar ecological niche. Andean condor in front of an Homo sapiens. Video of the extant bird with the longest wingspan–a great albatross. Note the difficulty they have with take off. If I could bring just 1 species of the extinct Pleistocene megafauna back to life, it would be Eremotherium laurillardi, an enormous ground sloth that ranged from tropical South America to the warm coastal regions of southeastern North America during warm climate phases. Although artists always depict all ground sloths as heavily furred beasts, scientists aren’t so certain about Eremotherium. Some ground sloths undoubtedly were heavily furred–the mummified remains of 1 species found in a cave did have fur. But this particular species was found in a colder region of South America. Tropical species of large ground sloths may have been lightly haired like modern warm climate megafauna such as elephants, rhinos, hippos, and humans. The difference between Eremotherium and Jefferson’s ground sloth (which ranged as far north as Alaska) might have been comparable to the difference between an African elephant and a woolly mammoth. The megatheridae, the extinct family of really big ground sloths, were closely related to the megalonychidae family which has 1 surviving genera of sloths. There are 2 species in this genus–Linnaeus’s tree sloth (Choloepus didactlylus) and Hoffman’s tree sloth (C. hoffmanni). They are mistakenly referred to as 2-toed sloths, but they actually have 2 fingers and 3 toes. Algae grows on their fur, so they are well camouflaged in the evergreen canopy of tropical forests. They are also closely related to the dwarf ground sloths that colonized Caribbean Islands and lived there until about 4000 years ago. Hoffman’s tree sloth is closely related to the Megatherium and Eremotherium ground sloths. Oddly enough, anatomical and genetic studies suggest the only other surviving genus of tree sloths is not closely related to Chonoepus sloths or any known species of ground sloth. The Bradypus genus of tree sloths is considered a “sister taxon” of all other sloths. Despite the similarity in appearance and habitat adaptations, sloths in the Bradypus genus evolved from a different lineage than Chonoepus sloths. Both genera evolved their arboreal adaptations independently–an incredible example of convergence. Most intact jungle ecosystems in South America have 1 species of each genera living in the tree tops. I believe this is a brown-throated tree sloth. I found this on google images where it is mistakenly labeled as Hoffman’s ground sloth. It is not closely related to extinct ground sloths and evolved its arboreal habits independently of Choloepus tree sloths. The Bradypus genus includes 4 species–the brown-throated (Bradypus variegatus), the maned (B. torquatus), the pale-throated (B. tridactylus), and the endangered pygmy (B. pygmaeus). 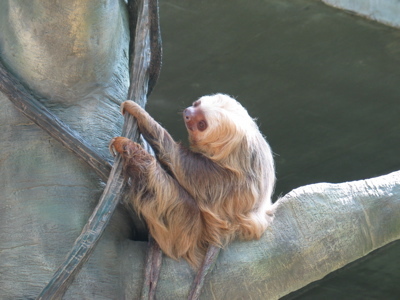 Tree sloths mostly eat leaves but also consume fruit, flowers, bark, and rodents. This is evidence giant ground sloths consumed meat when they could obtain it. Tree sloths are also known for raiding human latrines where they get minerals from human waste. Mother tree sloth climbing from a septic tank with a clinging baby sloth. –The honeybee is not native to North America, yet without this “recently arrived species” industrial scale fruit and nut orchards would not be economically viable. –Environmentalists mistakenly thought non native tamarisk trees were causing low water levels on the Colorado River floodplains. Millions of dollars were spent eradicating this species. But later studies showed tamarisk trees were not responsible for causing these low water levels. Their misguided policy greatly reduced nesting habitat for the endangered willow flycatcher, a species that uses tamarisk in lieu of willow. 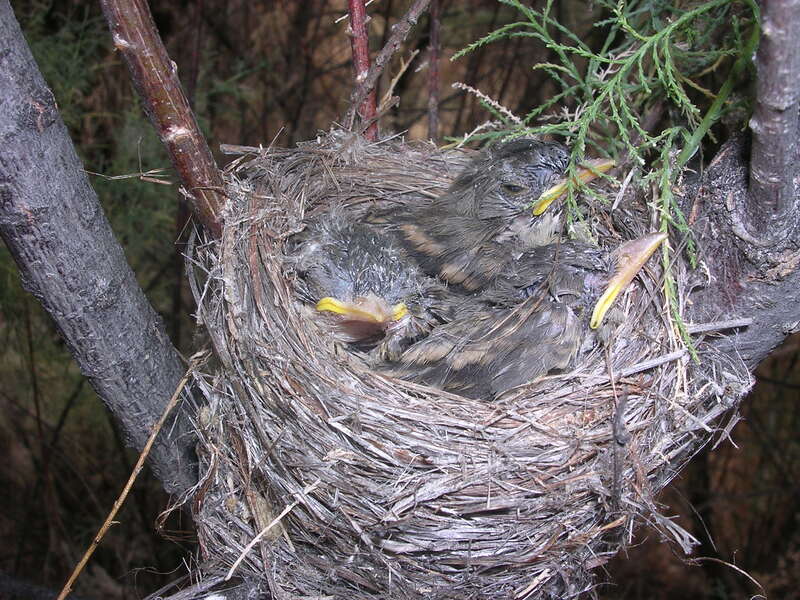 Endangered southwestern willow flycatcher’s nest in a non-native tamarisk tree. The government and groups like the Nature Conservancy spent millions eradicating this species of tree based on the false premise that it lowers water levels. Now this rare bird has far less nesting habitat. –Native trees can’t be re-established on eroded Puerto Rican forestlands unless non-native trees are planted first. With the help of non-native trees, 20 species of native trees were able to grow on badly eroded soils. –The presence of non native honeysuckle vines increases the population of robins and catbirds that feed on the berries. The increased bird populations acted as dispersers that helped increase native honeysuckle vine abundance. –Non native guavas in Kenya helped increase the population of fruit-eating birds there. –Non native grasses planted on reclaimed strip mines increased the population of endangered Henslow’s sparrows. –Non native shad serve as forage to help feed Pacific salmon. –Non native mussels serve as food for raccoons. –Butterflies utilize non native species as sources of food. –Non native cattle maintain early successional habitat, thus helping native species dependent upon this habitat. They’re a substitute for extinct Pleistocene megafauna. –African honeybees traverse the areas between fragmented forests in Brazil, aiding the pollination of plant species that could become inbred and sterile. Some regions provide refuge for species that are endangered in their land of origin. 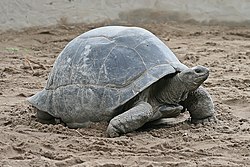 The Aldabra tortoise is native to a Seychelles Island but is more common in Mauritia where it occupies the ecological role of a now extinct species of giant tortoise. The Aldabra giant tortoise has been introduced to the island of Mauritia where another species of giant tortoise was overhunted into extinction centuries ago. It serves as an important disperser of native plants. Banteng, an endangered species of cattle native to southern Asia, breeds successfully in northern Australia. 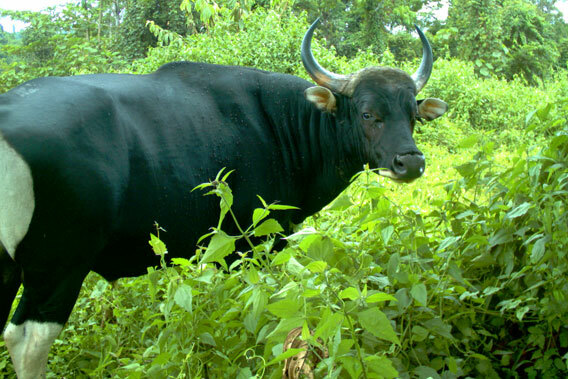 Banteng cattle face extinction in their homeland but have successfully established a wild breeding population in northern Australia. Hippos (imported by a rich cocaine baron) thrive in Colombia. Game ranches in Texas are the best hope for breeding black rhinos, currently extinct in Africa. Recently arrived species can cause the extinction of competing native species, but they can also instigate the evolution of new species. Non native house sparrows appear to be speciating in North America, according to the geographic region they have colonized. Desert populations of house sparrows have distinct physical characteristics from those found in eastern woodlands. A new species of honeysuckle fly exists today, thanks to non native honeysuckle vines. This species resulted from the hybridization of 2 closely related flies that hosted 2 different species of native honeysuckles. The 2 different species of fly both hosted non native honeysuckles, explaining how they began breeding with each other. The lonicera fly is the result of hybridization between 2 different species: Rhagoletes menax X R. zephyra. This new species resulted from the introduction of non native honeysuckles. The authors of the below referenced study suggest recently arrived species should be more carefully evaluated and managed and not blindly eradicated, simply because they are non native. You are currently browsing the GeorgiaBeforePeople blog archives for January, 2015.